How Long Does Powdered Milk Really Last? Does powdered milk ever really go bad? You may be wondering whether to use the powdered milk you found at the back of your cupboard. It's months past the "best by" date on the packaging, but you'd hate to toss it if that date is merely a suggestion. What can you expect for a true shelf life for powdered milk? Powdered milk can go bad, but it takes awhile. Most manufacturers recommend using powdered milk (also known as dried milk) within 18 months, but this is really just a "best by" date. According to the USDA, powdered milk can be stored indefinitely. An unopened package is probably still usable for 2 to 10 years after the printed "best by" date. 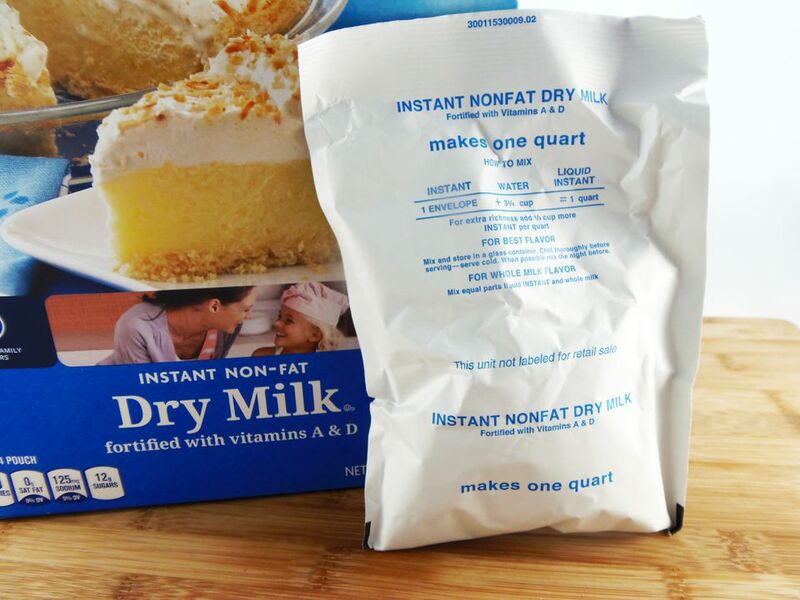 Some survival stores sell nonfat dry powdered milk labeled with a 25-year shelf life. But the shelf life does depend on the type of powdered milk. Nonfat powdered milk lasts longer than powdered whole milk or buttermilk, as fat is less stable. As such, nonfat dried milk is preferred for long-term food storage. If you are looking at the label of dried whole milk, you will want to use it up soon after the "best by" date. Dried milk lasts longer when free of moisture and oxygen. If it is in its original package and unopened, it will last longer. If you have transferred it to a storage plastic container or bag, you will effectively reduce its shelf life. The rule of thumb is to use opened containers within three months. To help yourself keep track, label any container with the date you opened it. Dried milk will also last longer when it is kept away from light. Keep it in a dark cupboard or store it in an opaque container such as a can or Mylar bag. It may look quaint stored in a clear jar on the countertop, but it won't last as long. Storage temperature is another big factor in the shelf life of dried milk. It's best to store it at a cool temperature. A Utah State University study found that storage at 50 degrees Fahrenheit (10 degrees Celcius) preserved the flavor best, while samples stored at 90 degrees Fahrenheit (32 degrees Celsius) had off-flavors after only six months and tasted bad by two years. At about 70 degrees Fahrenheit (21 degrees Celcius), dried milk developed unacceptable flavor after four years. The flavor of powdered milk isn't the only thing that changes over time. The vitamins in milk decline over time, while the other nutrients such as protein, carbohydrates, and minerals remain unchanged for years. If you don't use powdered milk often, you may want to consider freezing it. Just scoop some out as you need it. There's no need to bring it to room temperature first. This will keep your powdered milk fresh indefinitely. To prevent freezer burn, be sure to seal the package tightly between uses. Discard any powdered milk that develops an off-odor or yellow coloration. These are signs that the milk has finally gone bad. If the package has obviously had moisture enter it, you might be dealing with mold and bacteria growth. It's best to toss it if you have any doubts. Don't cry over spoiled milk! If you transfer dried milk from its original container, label it with the "best by" date and the date you transferred it, so you will know how old it is. If you won't be using it all up within three months, consider vacuum-packing and freezing the remaining dried milk. Once you reconstitute nonfat dry milk, keep it in the refrigerator and use it within five days.